It is not surprising or that atypical for such backup solution software. They set up change notification events on every folder they monitor. This, in itself, is a big task. Then sync’ing all that data. Still, you’re right, that is quite the peak working set! Similarly problematic I’ve found to be WD’s backup software, which tries to ‘categorize’ all your files first, then watches for each and every change. Talk about some massive resource utilization, even with its own memory leak at one time (which I reported, then they fixed). Hopefully this company will work on their virtual memory utilization. Jeremy, what makes it worse is that I disable realtime backup, and instead use scheduled backup. From the Java out of memory stack trace it looks like the app is inserting all items it finds in some kind of hashed container, and that this is where it ran out of memory. If this is truly how they built it, it is totally not scalable as memory utilization is a function of total files to back up. 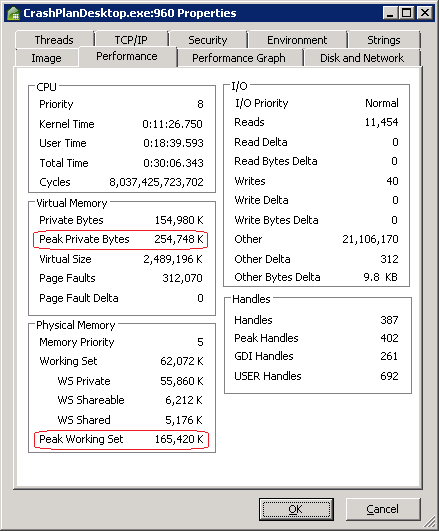 Pretty outrageous resource utilization – looks like a poorly written client. Thanks for the info. Came in handy! 3.4TB of data? 1.3GB of RAM? not really using that much RAM for that amount of Data.. if you have 3.4TB of data and don’t have 1.3GB of RAM to spare then its the user who should be blamed for an imbalanced implementation and management of data.. There are definitely shortcomings in their client, but if you come across another service that provides user-controlled encryption (448 bit blowfish), free offsite backups (to friends running crashplan), and cross-platform compatibility (windows, mac, linux) then please be sure to share. 1.3 GB backed up here and the service takes about 1 GB of memory. Sort of annoying, but like Harvey Knight says, it’s a good deal. Peter, I’m very grateful for this post. I don’t think I would have figured this out. I’m now backing up my important VM. It’s not a lot of data, but it’s still very important. Thank you. And I’m sorry about misspelling your name, Pieter! 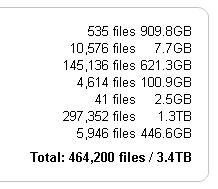 I have a backup set of 13 partitions, totalling at 1.5M files and 7.7TB. 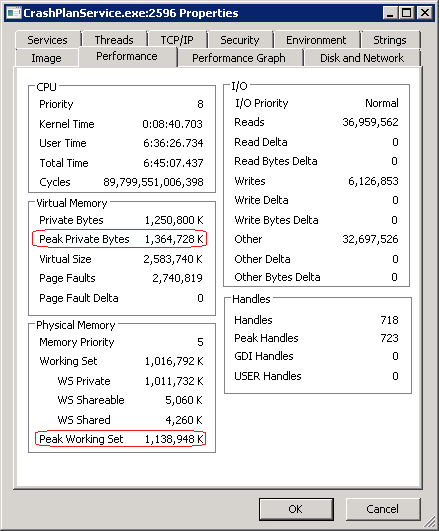 The CrashPlanService.exe reaches over 4 GB of memory use easily. I’m still in my initial backup phase, and I’ve heard that CPU and memory consumption go down after the initial upload has been completed – I’m hopeful. I really hope the other commenter’s report of planned native clients is true, although it’s been over two years ago and nothing has happened yet. It’s time everybody realises that, except for the most simple applications light on resource requirements, Java is never a sensible choice (especially in enterprise applications). The truth is that, if it wasn’t for CrashPlan, I would’ve long banished from my system the atrocity that is the Java Runtime Environment.